Custom fit to your schedule. Tailored to your personal diving goals. Schedule an academic session and cover all topics ranging from understanding gas planning, decompression strategies, tank factors, dissimilar tanks and more. 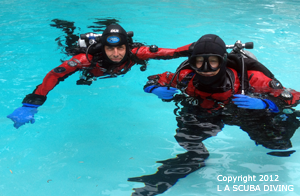 Gain Proficiency: Land drills sessions focus on understanding a doubles tank configuration, valve drills procedure, S-drills practice, communication and dive team formation strategies. In-water sessions with Steve to sort out buoyancy & trim issues, gain proficiency with valve drills, S-drills, team positioning and more. All water training sessions are filmed followed by video review debriefing. 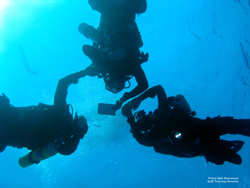 Prepare for GUE courses, technical check-out dives & more.